As the main accommodation provider at Sun Peaks Resort, Canada's second largest ski area, Bear Country Property Management features excellent vacation rentals in this one-of-a-kind Alpine village! Whether you visit Sun Peaks during the summer or winter, you are guaranteed a stay in comfort and luxury. Choose from a wide variety of options - from hotel rooms with kitchenettes to fully self-sufficient suites, condos or townhouses that come equipped with all the amenities of a home away from home! Or pick an impressive and spacious mountain chalet for a one of a kind getaway! Many properties offer easy ski-in/ski-out access, private hot tubs and of course breathtaking mountain views! Let us help you find the perfect home-away-from-home for your Sun Peaks adventure! Whether you plan a summer or winter vacation in Sun Peaks, your loved ones are sure to be delighted. Bear Country Property Management Ltd. makes sure you are taken care of and offers excellent lodging options. Find the right condo, townhouse, or hotel room for your family and unwind in this natural destination. Horseback riding, mountain biking, and plenty of festivals throughout the year are waiting for you! Your next Bear Country Property Management Ltd. getaway can be completed with a high-level tee time experience. Located over 1,200 meters above sea level, Sun Peaks' golf course is the highest elevation course in British Columbia! The course features 6,400 yards of terrain and 18-holes. Have a round of golf with your friends or teach your kids a swing or two! 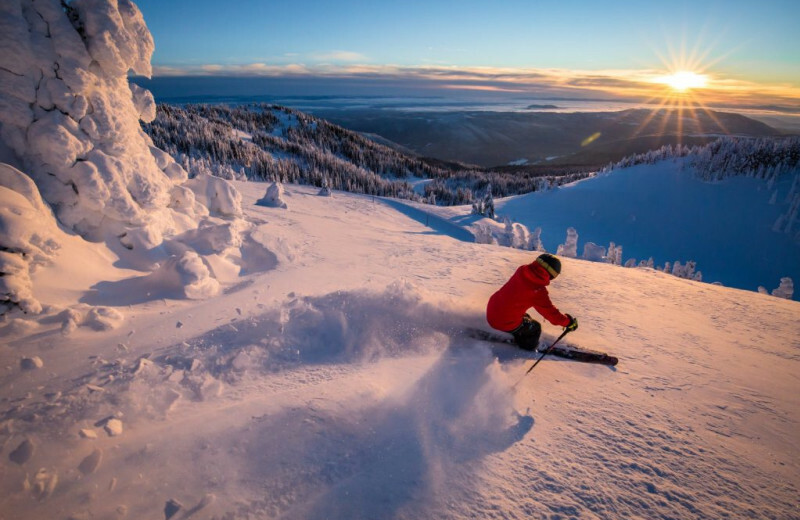 Nestled in the heart of the Sun Peaks, right at the base of Tod Mountain, Bear Country Property Management Ltd. offers winter sports enthusiasts a true retreat. Their luxurious condominiums and vacation homes have the ideal amenities you need. Indulge in easy ski-in/ski-out access, wireless internet, private hot tub, spectacular mountain views and more! Next time you plan a getaway to Sun Peaks, British Columbia, you don't have to worry about leaving your best friend behind, Bear Country Property Management Ltd. offers pet-friendly accommodations. This way Fido can also enjoy a mountain getaway, too! Go on a scenic hike during the summer or enjoy snowshoeing in the winter with your pet at your side! You will find the most lavish condominiums in the entire Sun Peaks with Bear Country Property Management Ltd. Their extensive list of lodging options allows you to find the one that best fits your needs. From luxurious two bedroom condos to multilevel units, Bear Country Property Management Ltd. offers great rentals with modern amenities to ensure you have the best experience possible!